The MSCI Asia ex Japan rose 42% in 2017, outperforming all other regional markets. Some investors are worried that Asia may have benefitted disproportionately from the rally in global technology stocks. This is because the composition of the Asian market has changed significantly over the last 3 decades with technology stocks now making up the largest share of the index at 29%, up from 0% in 1990. 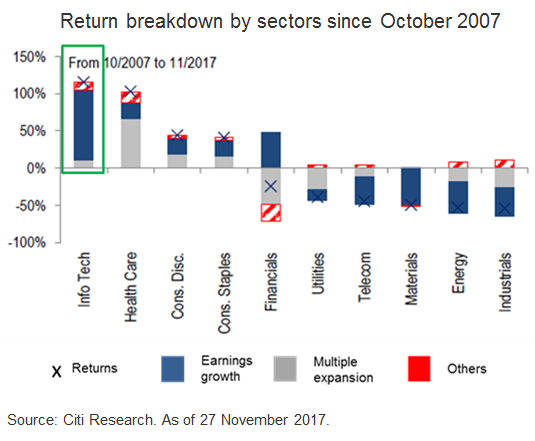 Tracking the Asian index's movement since October 2007 when it last peaked, Citi analysts suggest that the returns of Asian technology stocks has been driven by earnings growth rather than valuation expansion. See chart. Past performance is no guarantee of future results, real results may vary. In 2017, the earnings recovery in Asia was not limited to the technology sector. Earnings growth was broad based with 65% of companies reporting positive earnings growth. More analysts have also revised earnings up, rather than down, which tends to support share prices. Citi analysts expect Asian earnings to grow 12% in 2018, higher than the global average of 10%. With Asian companies exercising greater capital discipline, higher operating leverage is expected to drive earnings and profitability. Given healthy earnings growth, Asia's valuations have remained relatively attractive despite 2017's rally. On both price to earnings and price to book value measurements, the Asian market is only trading at its historical average levels. Citi analysts expect further upside in Asian equities in 2018 although given the rallies last year, investors who have exposures in both Asian and technology funds may want to rebalance their portfolios to avoid over concentration in the technology sector.